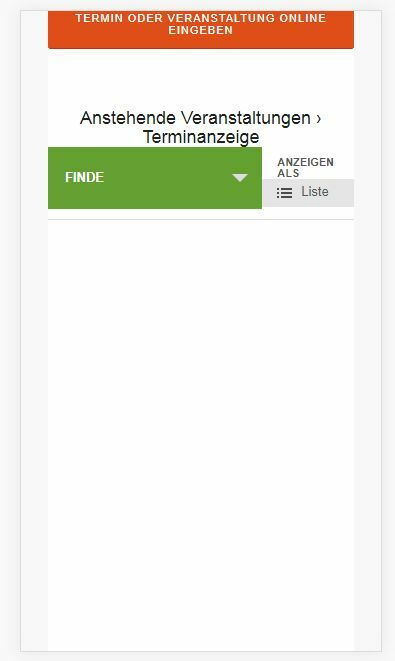 No events appear and the mobile menu (hamburger) is not displayed. After changing the theme to twentyseventeen the error does not appear. In the previous version of TEC (TEC 4.6.20.1, TEC Pro 4.4.29.2 and TEC Community 4.5.12) the error does not appear. thanks for the info. That’s indeed very interesting. I have reported the same issue here. There appears to be an issue with the tribe_mobile_setup_day function. We’ve found that disabling the calendar widget on affected pages (this is breaking certain forms for us) helps as a stop gap measure, so removing the calendar widget completely if it’s a site wide issue may be a temporary option. In fact, the js-error disappears when I turn off the calendar widget. However, no events will still be shown in the mobile view. The area with the events will then remain empty, see screenshot. So that does not help us much and we will wait until the problem is solved before updating to the latest release. Thanks for the feedback. We are seeing this error and as such, I have created a bug ticket so our devs can take a look. Not sure when it will be resolved at this point, but someone will notify you via this ticket as soon as we have a resolution. No problem and thanks for your patience! I have just installed the latest version of TEC (4.6.22) and TEC pro (4.4.31) at development environment. Unfortunately these issues are not solved and I cannot update the live version because of these issues. Will a solution be available soon? I am not sure on a date since this a fairly new issue. I know its being looked at. We will let you know as soon as its resolved. I have tested the solution mentioned in this thread, unfortunately without success. This is in response to the calendar not displaying on mobile with the Enfold theme. Not the separate Ajax issue. If you “undo” or disable the theme authors customization of The Events Calendar, the calendar will appear. Here’s an article on how to do just that. Once that is done, there’s still some residual styling issues that can be addressed by setting the Basic Template Settings to Tribe Events Styles instead of Full Styles. As you may know those and other plugin options were hidden by Kriesi, but will appear after removing the config-events-calendar from the functions.php file. Doing all this is just one way to prove or test that the issue is coming from Kriesi’s customization. Alternatively, you can roll back The Events Calendar to a version that was released around the June time frame which is when the theme was last updated. I know plugin authors always say that you should always be on the most current version, but when the theme author is not keeping up with all the changes, something will break at some point. I’m not singling out Kriesi, this goes for any theme author who highly customizes a plugin to their liking. Bottom line is that the issue needs to be addressed by the theme author. In viewing the Kriesi forums, others have reported this same issue, so it looks like it is on their radar. Then I found this article, which goes back to my point that the theme author needs to address this. It seems to resolve the issue. I will test it in the next days and then report if the problem is solved. Thanks for posting this Mathew! Let us know if this works for you in the meantime Hans-Gerd. The error is still happening with the Twenty Seventeen theme, not sure why you are not seeing it. “Uncaught TypeError: Cannot set property ‘date’ of undefined” when viewed at a mobile width. Welcome to the forums and thanks for chiming in. For the sake of keeping things clean — as your issue seems a bit different than the original — I would kindly like to ask you to open a separate topic. We will be here to help you out and you will get your own personal consultant who will be focusing on your issue. Is it thought to fix the problem (without workaround) ? – the theme (enfold) is a quite common theme and therefore some other users might be affected as well. This plugin is to help test and disable some of our scripts that may be conflicting with your theme. thanks – I will check it. If you are working on the issue, then I would disable the appropriate functions in single-event.php and wait until the issue is fixed. We build our plugins to proper coding standards so we do not go in an attempt to code around a specific theme. We do have a current bug report for the JS timer issue and two themes are notated (Avada and Enfold) so usually in cases like these will reach out to theme developer and let them know of the issue. Avada has our plugin built in so issues with themes get fixed fairly quickly. I cannot guarantee when it will be fixed as it’s in the development team’s hands now. They need to assign it, code it, test it, and schedule it for release. I would also check with Enfold to see if they have a patch since many of their customers use our products. thanks for the info and the advice. I will contact enfold if necessary. I have updated TEC in the meantime and it seems to work good except for this issue. Okay, let us know what you find out.